All Zhang Jiao's attacks are lightning attacks. When Jiang Jiao receives lightning damage, he is healed by that amount rather than being damaged. Zhang Jiao is always considered in chains. When Zhang Jiao damages another player with an attack, that player becomes in the chain. Zhang Jiao can discard two cards to give himself one lightning damage. When he is damaged with lightning damage, he can discard X black cards to give the damage to anyone else in his attacking range. X is the amount of damage being passed. All Zhang Jiao's Attacks and Fire Attacks are all considered to be Lightning Attacks. He does not have a choice. Zhang Jiao puts players into chains through "Storm" after all the effects of the attack. 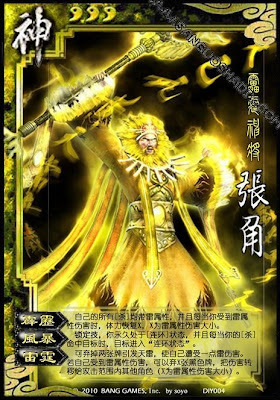 Zhang Jiao can discard both black hand cards and equipment to use "Thunderclap".